The Mini Disc Brushes feature a composite hub and a very high filament density. 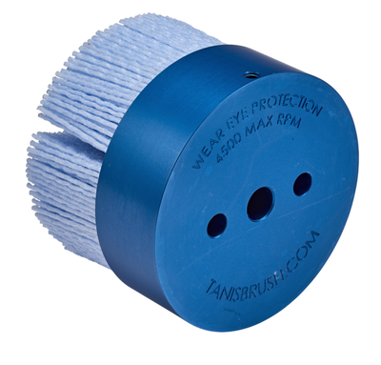 There are numerous applications where these brushes perform brilliantly including small area deburring, surface preparation and finishing, rust and scale removal, sand and texturing, blending surface marks and edge radiusing. The CeramiX® Mini Disc Brushes feature an innovative 3M grain providing enhanced cutting action up to 3 to 5 times faster than traditional abrasive filaments. The Mini Disc is also available in silicon carbide, a durable grain that is widely used in industrial applications and preferred for finishing ferrous metals. The Mini Disc Brushes can be easily mounted into automated machinery, custom-designed equipment, CNC machining centers and robotic centers.